In a heavy saucier or pan heat the cream to boiling. Stir often until reduced by half. Add 1 c. half and half and reduce for about 5 minutes. Add all the cheeses and season with a lot of fresh ground black pepper. Add the bag of greens and stir to wilt. Season the chicken with salt & pepper. Heat 3-4 T oil in a large skillet. Cook chicken 5 minutes each side or until just cooked through. Place on a platter to rest. Bring the sauce back up to a low simmer and add the pasta. Toss with tongs to blend. 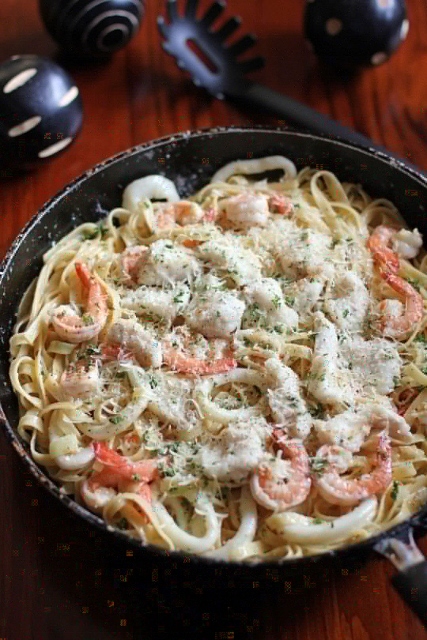 Place pasta on a large serving platter. Slice the chicken and fan over pasta. Top with sliced peppers and serve. NOTE: You can sub in shrimp for the chicken! !